EightPak relay box with SO-239 connectors, indoor use, needs a controller or controllers, see options below or click here. This compact system allows you to share up to 8 different antennas with 2 different radios. Perfect for Multi-Single, Multi-2, and some small Multi-Multi contest operations. For DXers or collectors with two operating positions, you can now connect any of 8 antennas to up to 2 of your stations without rewiring or moving coax cables. 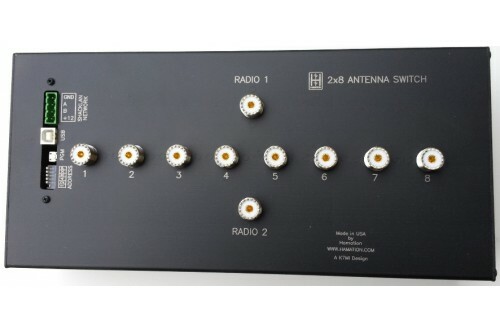 The EightPak can be Daisy-chained to control more than eight antennas. The system continues expanding our 4-wire control infrastructure and will integrate with existing 4-wire systems that include our BandMaster III band decoders and the FilterMax IV (W3NQN) band pass filter systems. 3) Click here to go to www.hamation.com and click on "Control Center' on the side bar. The band decoder that is part of the Integrated Controller supports Icom, Kenwood, Yaesu, and Elecraft K3 radios. Interface cables for your radios are available for $40 each or less. A complete system will consist of one EightPak relay box and the DRC-8 controller or any assortment of up to three more controllers. The manual controller will integrate with BandMaster decoders you may already have in your system. Indoor Version: The box is 13" x 6" x 3.25" and the flanges are 1/2". Can be used with manual controllers or via RS-232 or USB interface. Low VSWR to 55 MHz. 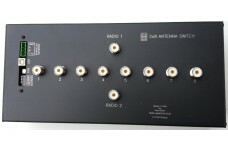 PB-28: Can be used by up to two of the radios connected to the EightPak. Integrated Controller: Includes band decoder to read the band information from the transceiver and will select the antenna programmed for the selected band. One controller needed per each radio connected to the the EightPak. 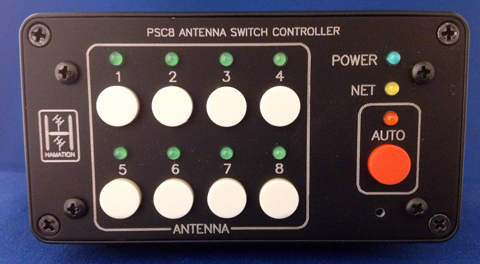 PSC8: One controller needed for each radio connected to your EgihtPak system. Bandpasser II: Six band band pass filter system. Will select the filter automatically or manually. One unit needed per each radio connected to your EightPak system. 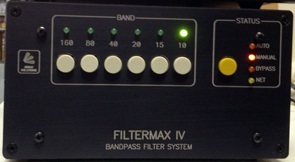 Filter Max IV: Six band band pass filter system. One needed per each transceiver connected to the EightPak. Some connections options for filtering and control automation shown below.